So what happens when you really want chicken fajitas and rice for dinner and you don’t have Fajita Seasoning Mix in the pantry? You make your own! This isn’t the first time I’ve mixed up my own. Actually, I’ve been mixing up my own for quite some time. It only took one time of making this to realize I’d never go back to the store-bought packets again. Besides knowing exactly what’s in my seasoning, my husband raves about the flavor every time I make this. 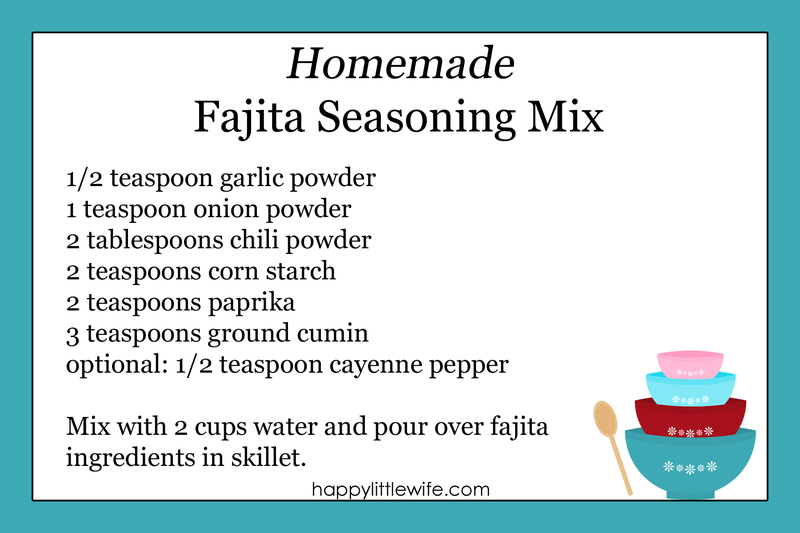 I just measure out the spices and mix it up fresh each time I make fajitas, but you could make a few of your own packets by mixing it up ahead of time and storing in little zipper snack bags. You’re going to want to check your spices and make sure you have all these on-hand to make your own! Two weeks ago I wrote “Homemaking: A Calling and a Blessing” – my kickoff to my own 40 Days Challenge. My goal over these forty days is to de-clutter and organize our home, along with making our home more peaceful. The first week started off great – I cleaned and organized our upstairs hall and linen closets and hauled two bags of trash out of the house. I felt good. Last week, I tackled our son’s bedroom. He has a lot of storage (because we love IKEA) and that makes it much easier to “collect” stuff – there’s plenty of room for it! So I spent an entire day clearing out his closet, dresser, and wardrobes. I boxed up toys that were no longer age-appropriate, put clothes that I wanted to save (I have my own issues with letting go of “baby stuff”) in totes to put in the attic, and made a big box of clothes to sell and/or donate. So what’s the problem? My first two weeks were extremely productive. The problem is that the peace I am really wanting is lacking. I am still worrying. I am still raising my voice (this is the big problem for me). I get in bed at night and I feel defeated. Tuesday was my breaking point. I put my foot down and told myself that was the last “bad day” I was going to have. I said I was going to create peace in my home – and I will. On Wednesday, I sat my two little munchkins down and explained to them how things were going to work. They were told that I am no longer going to raise my voice and that they basically have 10 seconds to shape up and change their behavior or they will find themselves in time-out. We also briefly discussed how less nonsense will lead to more fun together. Wednesday and Thursday were much better than Tuesday and I have hope for tomorrow. I will say that my (almost) five-year-old responded much better to this than the (newly turned) three-year-old. Aside from one major tantrum from the little one in which she was having no parts of time-out, we had two peaceful days. We even managed to watch a movie in the middle of the day and make a St. Patrick’s Day craft on Wednesday and today I was able to bake five dozen cupcakes. This simple approach truly worked like magic. I stopped both my kids in their tracks by saying, “Take 1.” My husband couldn’t believe his eyes during breakfast when little Mr. Man was ready to throw a fit, but instantly stopped when I started to count. It gives the child a few seconds to stop and evaluate their own behavior and to decide if they want to continue and possibly end up with a consequence or just let it go. And the best part is I don’t need to get upset or raise my voice. Ahhh… there’s that peace I want. I intend to be consistent with our new approach and to create the peace our home needs. I will be writing a follow-up post next week to update you on our progress and to include some positive reinforcement ideas I have up my sleeve from my teacher days. I am not 100% sold on “time-outs,” so I will be implementing time-out alternatives, which the book does discuss as well. 1-2-3 Magic is very easy to understand and gives many real-life scenarios. There were times when I thought the author actually knew my kids! While it is evidence-based and written by a clinical psychologist, it’s not a text-book. You’ll fly right through it and feel ready to make a change. I say this because I know I am not alone in this struggle and that this just might be the help you need too. I recently discovered that I am a hoarder of cupcake wrappers and sprinkles. 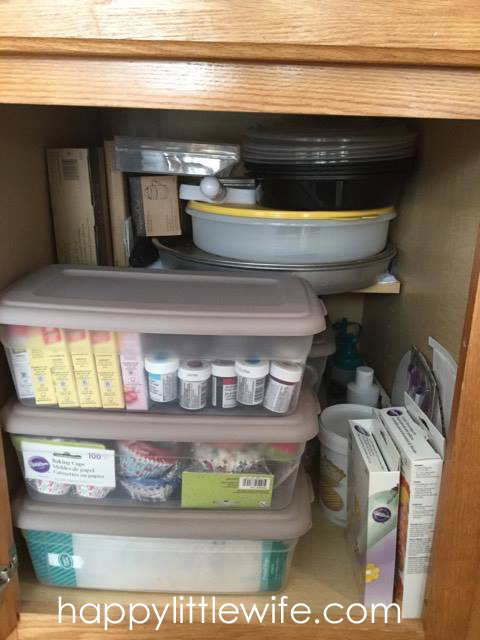 I also discovered that my baking supplies were a complete mess – I had cupcake wrappers shoved in three different cabinets (all of which contained baking supplies), I had sprinkles tucked in multiple places too, and we won’t even talk about what my actual “baking pan” cabinet looked like. I love to bake, but I dreaded getting my supplies to do so. It actually got to the point where I just started keeping my cupcake pans in my oven because it was easier than lifting or moving stacks of cookies sheets or other pans to get to them. I became so frustrated that I decided to re-organize every cabinet in my kitchen, de-clutter, and get my act together so I could actually enjoy baking. I tackled the baking cabinets first. I had one corner cabinet which had a lot of wrappers, sprinkles, gel colors, and other random supplies. 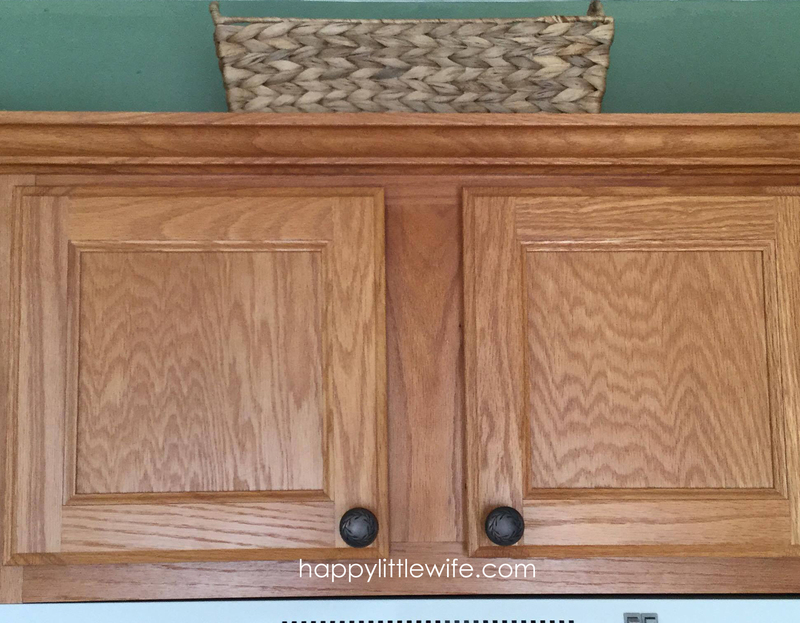 Then I had a small cabinet next to the stove with mixing bowls, and the overflow of my baking pans. Finally, my island is one big cabinet which houses all of my baking pans and cake/cupcake carriers. (This was by far thee worst cabinet.) My only regret is not taking before photos, but just imagine a giant mess everywhere. Seriously. Maybe I forgot to snap pics on purpose because I would have been embarrassed to actually have to share them! So here are my tips that have made me the happiest little baker! 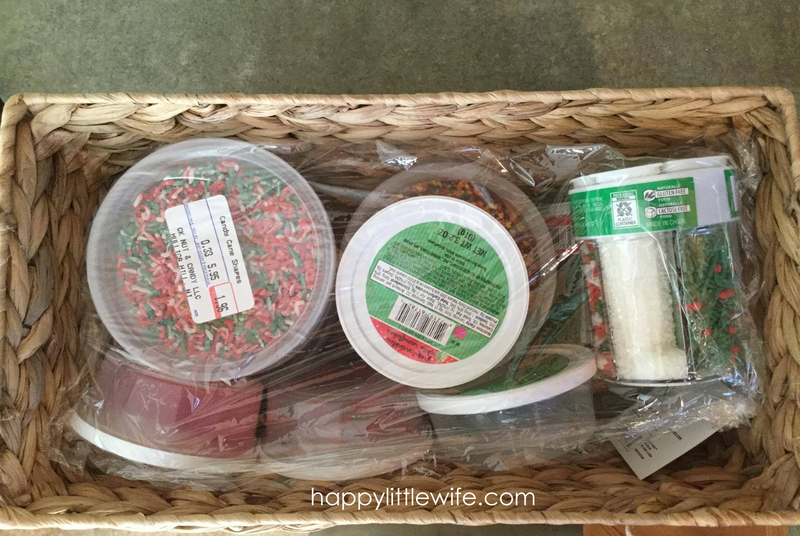 TIP #2: Separate all the Christmas / Seasonal sprinkles that you’ll only use once a year. I chose to put mine in a nice basket, covered with plastic wrap to eliminate any dust from getting on the contents, and put it on top of my cabinets. It makes a nice decoration while serving a purpose. I actually have 2 of these baskets – the other one is holding seasonal cheese spreaders and small serving pieces. TIP #3: Remove all the seasonal/specialty baking pans that you’ll only use on holidays or for special occasions. This cleared out a lot of my mess from my big baking cabinet. These pans were constantly in my way and because they are all different sizes, it made it worse. I put them all in this container and marched them right down to the basement. They now live on a shelf down there until they are needed. TIP #4: This is my favorite. I only wish I had found this organizer sooner. It was the best $24.99 I have ever spent. I no longer need to struggle to get out my baking pans. 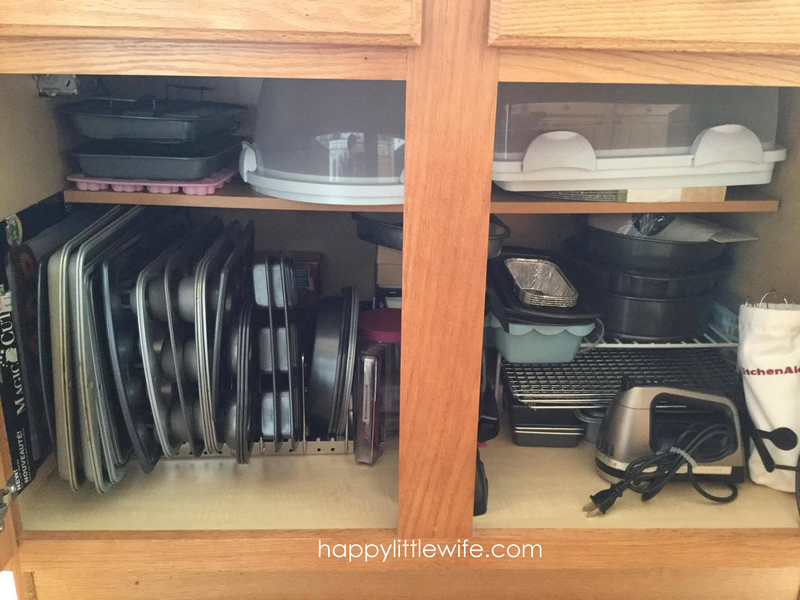 Everything is neatly sorted and there is no “domino effect” when you pull out a pan. The dividers can be moved to fit your needs. 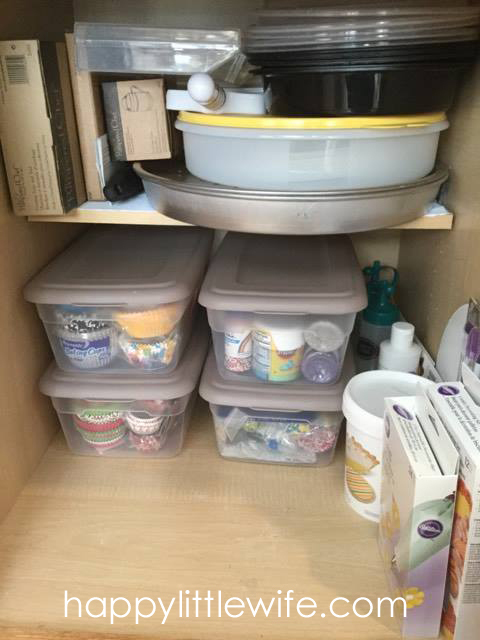 That’s the best feature – you may find other organizers that look similar, but it’s really the ability to move the dividers that makes this organizer perfect for bakeware. It is super sturdy and works like a charm. This is the cabinet I really wish I had a “before” photo of because it was a disaster. I couldn’t get anything out easily. My expanding cooling racks now sit nicely on top of a few pans so they are easy to grab. I was even able to stand that terrific Presto Flipside Belgian Waffle Maker up in the middle of the cabinet without it being in the way. I also used a shelf organizer to add some extra space for my loaf pans, spring form, and bundt pans. So there you have it! 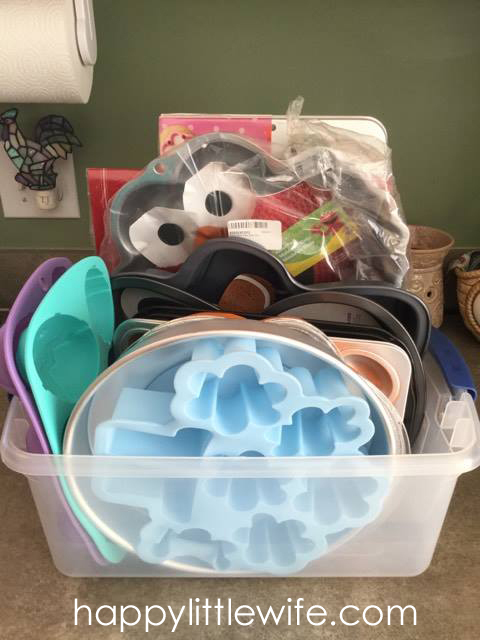 A few simple tips to organize your baking supplies so you can spend less time wrestling your pans and more time baking up something sweet! 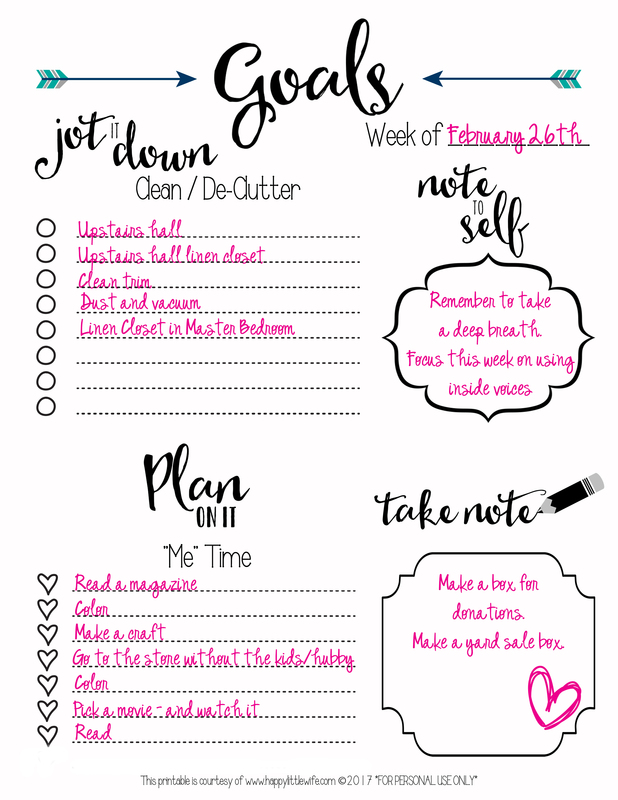 Goal-Setting Worksheet – FREE Printable! It’s easy to say I’m going to do something, but does it always happen? Nope. Not always. Why? Because I over-plan in my head. I’m really good at holding myself accountable when I write things, whether it be in my Happy Planner, a notebook, or on a printable. I created this Goal Setting Worksheet to help keep me on track for my own 40 Days Challenge. My plan is to take 10-20 minutes each day to work on one of the tasks on my list. For me, 10-20 minutes is completely do-able. If I disappear for any longer than that, who knows what kind of catastrophes will occur elsewhere in the house! My kids really love to be “good helpers” so I’m sure I can even assign them a little job alongside me while I de-clutter the linen closet. I’ve included a “Note to Self” section on my worksheet because I think it’s important to remember what my ultimate goals are for my home. I plan on focusing on one thing each week, but not forgetting it after the week is over… the goal is to make these little goals the new norm in our house. If you’re ready to set your goals, go ahead and print eight copies of my worksheet and put them in a folder so that it’s one less task to do each week. You’ll be able to sit down and write out your tasks. Don’t worry about writing on every line – write what YOU know YOU can do!